Hundreds of clenched fists were raised Wednesday afternoon at Albany’s Empire Convention Center. Behind a security checkpoint defended by state troopers in rigid-brimmed campaign hats, New York governor Andrew Cuomo delivered the annual State of the State address to a room packed with clapping hands. In the longest such speech in the state’s history, Cuomo covered everything from an initiative to increase gambling revenue to promoting tourism. He even found room on the podium to lay out plans for an Adirondack Whitewater Challenge that would include a “Politician Division” in which government officials and their staff from would race each other on rafts. The segment of Cuomo’s address that has received the most media attention was his impassioned plea for tighter gun control. But one smoking gun escaped his mention: high-volume hydraulic fracturing. 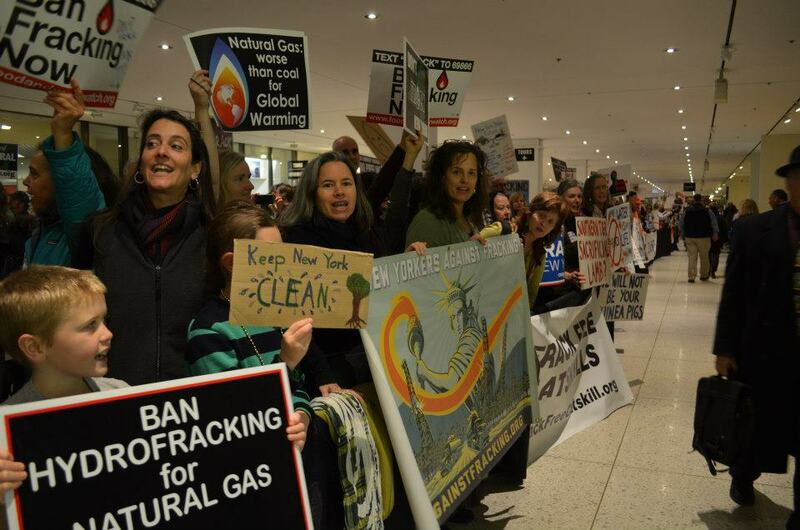 A moratorium on the controversial shale gas drilling method is set to expire at the end of February, so activists on both sides of the debate came to Albany to make their voices heard. While there was a small cluster in favor of drilling, the vast majority of the more than 1,500 people in attendance were there to tell lawmakers not to let fracking poison their air, water and soil. Many had traveled from across the state, including legendary folk singer Pete Seeger, who led the crowd in a rendition of “This Land is Your Land.” Later, with fists in the air, they took a pledge — mic-checked by biologist Sandra Steingraber — to conduct nonviolent civil disobedience before the gas industry is able to make good on the thousands of New York land leases it currently sits on. The DEC doesn’t see it that way. It is expected to file rules to regulate the massive quantities of water, silica sand and dangerous cancer-causing chemicals that will be injected into the state’s Marcellus Shale formation, while ignoring the toxins that will be filling the air. This process, not surprisingly, has been shrouded in secrecy, but dubious dealings with the gas industry have come to light. Emails obtained by the Environmental Working Group in July through the Freedom of Information Act revealed that DEC Deputy Commissioner Steven Russo had shared details of potential fracking regulations with a lobbyist representing gas drillers. The New York Times also revealed that one of the contractors hired to review the DEC’s analysis of fracking has ties to oil and gas companies. In a letter to the Joint Landowners Coalition of New York last week, DEC chief Joseph Martens sought to assuage fears among the pro-fracking lobby that Cuomo would keep the moratorium in place. Martens said that the governor — who received $150,000 of the roughly $200,000 in campaign contributions that energy firms made in the last gubernatorial election — had personally asked him to reach out to the group. While energy corporations seeking to usurp land and resources have much at their disposal, sometimes nature itself, unwitting lends a helping hand. Catherine Yeager lost her home and all her possessions in Far Rockaway, Queens when Superstorm Sandy came to town in October. Since then she’s slept on a series of floors and couches. Not long after the storm, Yeager was volunteering at a former vegetarian restaurant she helped convert into a relief hub when she learned that a mega-gas pipeline was headed for the Rockaways. The U.S. House of Representatives approved the New York City Natural Gas Supply Enhancement Act, which will expand the city’s use of natural gas sourced through fracking. As the deadline on the fracking moratorium nears its expiration, environmental groups have hinted that they have already drawn up lawsuits and will contest approval. The legal challenges could tie up any potential drilling plans for as long as two years. Beyond the courtroom, though, several thousand activists are planning to form another line of defense and make good on their oaths of direct action. At the State of the State, while Governor Cuomo jokingly laid out ground rules for the rafting race he plans to take with fellow Albany politicos, Reverend Billy Talen led protesters in a “power prayer” that took aim at Cuomo. A thousand protesters showed up at the State of the State last Thursday, but Cuomo didn’t mention fracking. In a letter to the Joint Landowners Coalition of New York last week, DEC chief Joseph Martens sought to assuage fears among the pro-fracking lobby that Cuomo would keep the moratorium in place. Martens said that the governor — who received $150,000 of the roughly $200,000 in campaign contributions that energy firms made in the last gubernatorial election — had personally asked him to reach out to the group. “We’ve just hit walls with a lot of our municipal governments,” said Isaac Silberman-Gorn, an activist with the anti-fracking group Citizen Action in New York’s Southern Tier, a region very much on the gas industry’s radar. “The reason being: They’re bought and paid for. Fracking is a toxic threat to American communities and the climate. It squanders prodigious quantities of our most precious resource, water. Furthermore, it is likely, although it is hard to gain the fracking industry’s cooperation in proving, that over time fracking water and toxic chemicals seep through the earth’s substrata, poisoning groundwater and aquifers, and even returning to the surface, where they pollute and permanently befoul–not just surface water–but all the surrounding acreage. This exploitation of the planet and wanton destruction of irreplaceable resources can no longer be tolerated. Now we know. Fracking far exceeds the limits of sustainable practices, even without considering the impact of the methane being extracted for burning. People are responsible for guarding resources for future generations. Fracking is a wanton violation of this principle. Allowing fracked gas exports would dramatically increase the scale of and demand for fracking in the United States by giving the fossil fuel industry access to huge foreign markets. Furthermore, these exports would profit the fracking companies at the expense of everyone else. Fracking for export is unwise, unjust and untenable. Stand up to the fossil fuel industry and deny all applications to export natural gas.